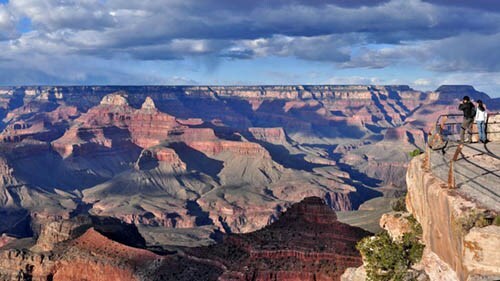 You have many options to get from the Grand Canyon to Phoenix including the Greyhound bus, Shared ride shuttles, taxi services, the Grand Canyon Railway in Williams, AZ, Uber and Lyft. At least that's what most people think initially. Here are the details, so you can make the best decision for you and your family. Just to get started there are no taxis, Uber or Lyft service in the Grand Canyon. Why? No one actually lives there. The nearest cities that would provide drivers to transportation networking companies like Uber are hours away. At most there might be one taxi in the whole area with one car, which is probably unavailable most of time when people try to get last minute ride. Unfortunately, taxi rides are extremely expensive at about $2 to $2.30 per mile. The distance from PHX to the Grand Canyon is a significant drive that normally takes 3 hours and 51 minutes with no traffic. At $2 to $2.30 per mile your taxi ride would cost $465 to $535. Taxis do offer door to door service, so at least you don't have to find a way to get to or from a bus stop. Taxis are generally just regular cars with a lot of miles on them. They usually have a lot of history of drunk people throwing up, loss of bodily fluids and body odor. Drivers do their best to minimize these smells, but it's to be expected. You may even find some illegal substances on the back seat, carpet or under the seat if the driver didn't notice them before they picked you up. Assuming you could be get an Uber, which is extremely unlikely. They charge about $1 per mile, and there's no guarantee a driver will actually be available when you schedule one. In other words the app doesn't actually search for a driver until the moment you need one. Additionally, Uber and Lyft drivers only get paid to drive one way and they typically don't want to drive 8 hours straight just to get back home. Especially since that means driving 4 hours for free to get back home. It is extremely unlikely they will have a trip going back the other direction. This means they will almost always cancel right after they show up. The actual cost if you could find an available driver that wants to go that far is $235 each way plus the cost of getting into the Grand Canyon National Park. This means they are extremely unreliable. In locations like Phoenix where we've tried to get an Uber or Lyft to Tucson or Sedona, the driver will normally show up and cancel 3 times, which is about a 35-45 minute delay. Not only that they also charge you a cancellation fee each time and there is no number to call their customer service. That's $5 to $10 per cancellation times three or $15 to $30 in cancellation fees. If you dispute them Uber will block you until you pay the full amount. You can't call them, and good luck trying to figure out how to get a refund through the app. In places like the Grand Canyon that are twice as far it makes sense that they are much more likely to cancel meaning they may cancel twice as much or four to seven times. Once you actually get to the Grand Canyon, you probably won't need a car. The Grand Canyon Village has lots of things to do. The are great restaurants like the El Tovar in the El Tovar Hotel. Great hiking from the hotel around the south rim. Hiking actually down into the canyon is a one day trip each way. Mule rides, camping spots, and cabins on the Colorado river have to be booked at least one year in advance. They have phenomenal helicopter tours both over and inside the Grand Canyon. The average length of stay for most families is 5-9 days. Cheap rental cars are about $45 per day before taxes. This brings the total cost with taxes to about $300 to $540. Lets just say $450 on the average plus gas. Gas for a 7 hour drive is about $70 if you don't drive to the north rim. That brings the total cost for a rental car to about $520. What if I decide to take the Amtrak train or the Grand Canyon Railway? There is no Amtrak from Phoenix to the Grand Canyon or from Phoenix to Williams. Amtrak trains run west to east and vice versa; they do not go north and south. If you decide to ride the Grand Canyon Railway to the south rim, you still need to find a way to get to Williams, AZ from PHX. Riding the train is a fun experience, but Williams is not in the Grand Canyon. It takes about an hour and a half more excluding the time you will wait in between to get on the train and leave Williams. 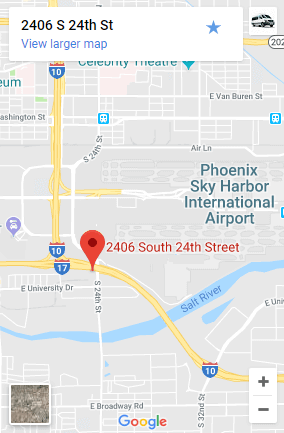 The distance from PHX to William is a significant drive that take about 2 hours and 30 minutes by car with no traffic. The Greyhound bus does not go to the Grand Canyon. They also do not pickup at Sky Harbor Airport. You have to pay for a Taxi or other provide to get to the Greyhound terminal in Phoenix. The only other companies with buses are already in the canyon and do tours. These tour companies don't provide long distance transportation between other cities. So realistically what are my options? Taxis and rental cars are too expensive. Buses, Uber and Lyft are unavailable. The only remaining option is a shuttle. There are two kinds of shuttle companies. Arizona Shuttle companies that operate like a bus with multiple stops and multiple people that pack passengers in like sardines, and shuttles that offer private car services without having to pay the same price as a black car are definitely a much more convenient and affordable option. Not that we are recommending most people book a black car, you can see what they cost in the next paragraph. For example, black car services are normally $3.30 per mile for a luxury car that hypothetically seats up to four or $4.15 per mile for a luxury SUV that seats up to seven. The cost for a black car to the Grand Canyon is about $765 to $963 each way. The shared ride shuttle packs people in like sardines and takes about twice as long, because they stop and wait over and over again for other passengers. These shuttles are very similar to taking a Greyhound bus. You will have to wait at the airport for a shuttle to show up each hour and fill up with enough people to go, and then stop multiple times to switch people. They may not go at all if there aren't enough passengers. They normally charge about $80 per person each way. Two people would be $160 each way. Three people would be $240 each way. Four people would be $320 each way. The ride to the Grand Canyon with this company takes about 8 hours. The actual cost including tip is about $88 to $96 per person since normal gratuity is about 10%, 15% or 20%. Once you get there they leave you at a bus stop. You can either walk with all of your stuff or get a local taxi to drive you the rest of the way. So what's the solution? The Grand Canyon Shuttle that operates like a private car service. We pick you up in a nice car and drive you straight there. The ride takes about 3 hours and 50 minutes. We operate 24/7 on your schedule. It's just you non-stop going straight to your destination. Airport Shuttle of Phoenix owns Grand Canyon Shuttle, Flagstaff Shuttle and Williams Shuttle. Our service revolves around your needs. Pets are okay. Debit cards are okay. We have plenty of room for bags. All our vehicles are have plenty of room on the inside, and they are usually luxury cars. If you have a bunch of bags or people, our Mercedes shuttles can accommodate 4-42 people and 40-100 pieces of luggage. All vehicles are non-smoking, clean and well maintained. Most vehicles have leather interior, lots of leg room, and a very smooth ride. Drivers are all thorough background checked by the airport, trained, and most of them have been driving around customers professionally for more than 10 years.